Joe Theismann is one of those guys that a lot of people don’t like. He talks a lot and has strong opinions that may not always stay the same day to day. But really, who doesn’t change their mind and who doesn’t like a good story teller. For me, he was the QB for my childhood team and led my guys to back to back Super Bowls. Unfortunately, he only one the first one but should have easily won the second one over the Los Angeles Raiders. But that’s not what this is about. 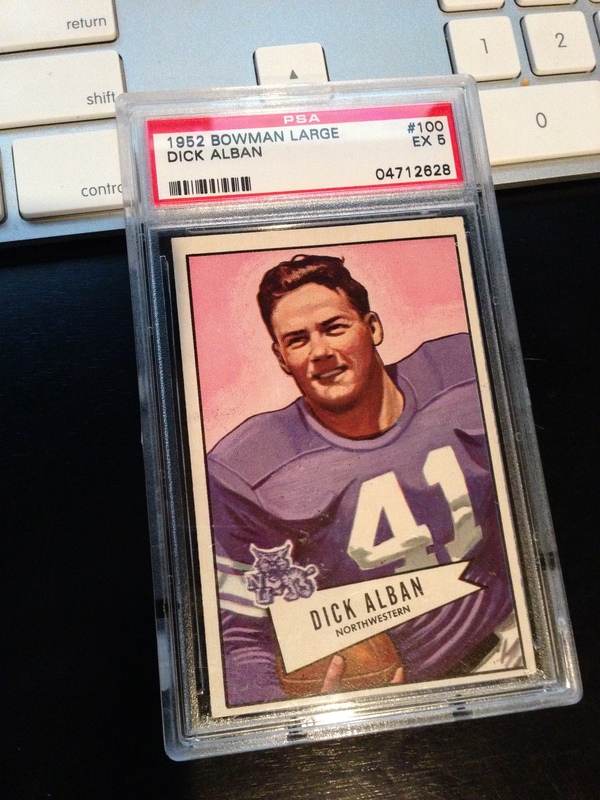 This is about his NFL rookie card, not his CFL Rookie card, that’s a white wale or Holy Grail if that’s what we are calling it now? This was another pick up over the summer months and was picked up for a fairly good price. The photo is pretty terrible though? It’s dark and shadowy. Wouldn’t fly in today’s hi-tech photography and editing programs that exist, not to mention there is so much noise in the background that it really tends to detract from Joey Sunshine. Either way, it’s a lovely piece to add to my collection. 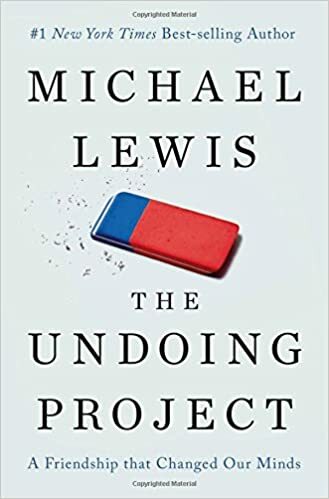 As i mentioned, i am still doing all the things that we do as collectors and i’ve managed to make some great progress in getting organized and up to date on my checklists…thanks to a few late nights on the home computer and an extended vacation from work. 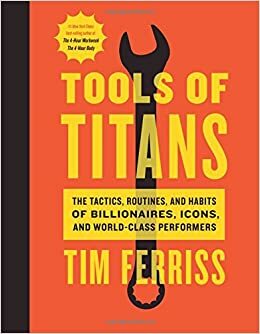 My main focus has been on getting everything logged from the 1950’s-1990’s. Everything was sweet until i hit the abyss of the mid 90’s when subsets and serial numbers and various parallels became all the unreasonable rage. This was also the period of time when i put the hobby aside to be a 20 year old male. I’ve regained my focus and will have some checklists updated in the next few weeks to months as they get incorporated in to google docs. Enough with the words. 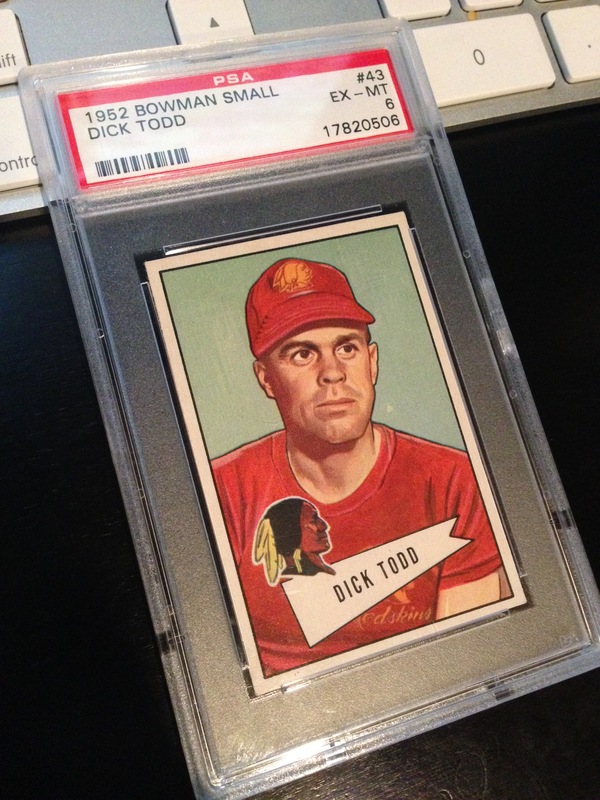 Here are some photos of a few cards from the 1950 and 1952 Bowman sets i’ve picked up the past 6 months. Normally, bloggers like to save their best for last. Not me. This one cost a few nickels but was very much worth it to me. 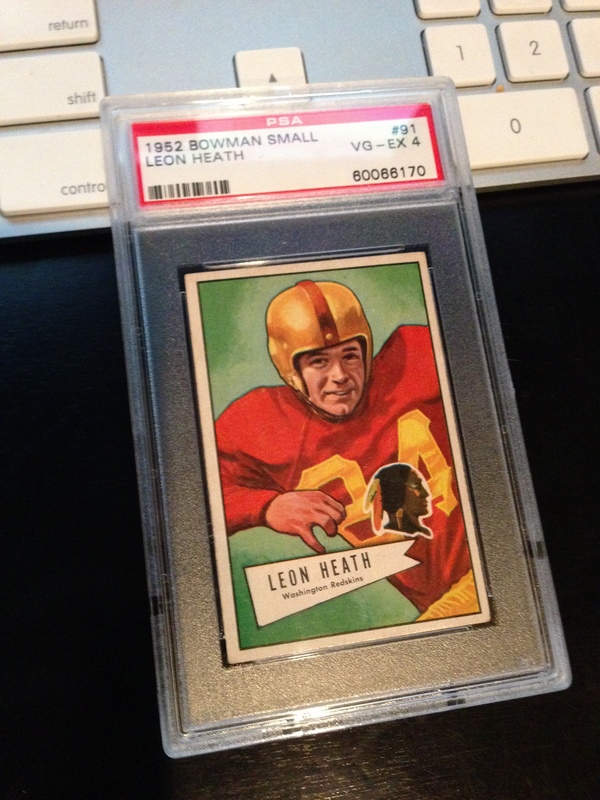 It’s a beautiful card and centered fairly well…the corner are in pretty nice condition too. I looked at a few 8’s that were available on eBay and were well outside what i could spend and feel ok with myself. This one wasn’t too bad and it’s in great shape. 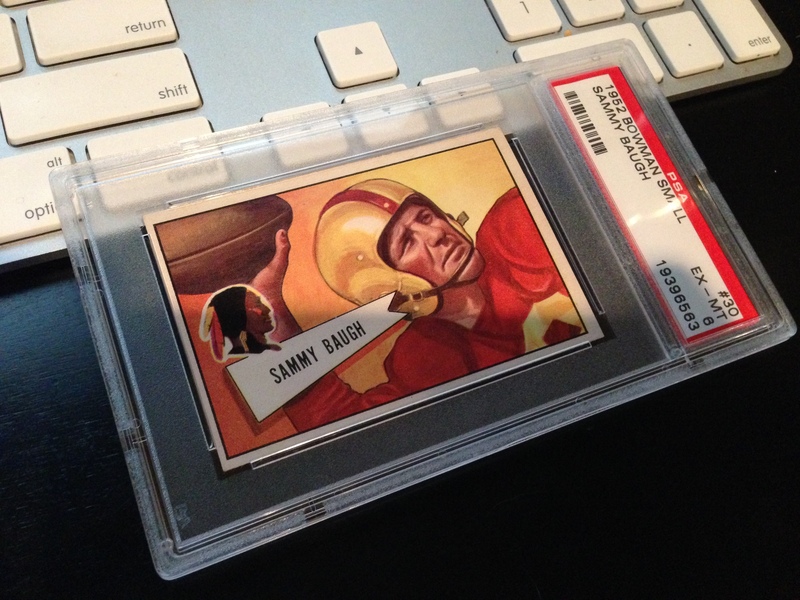 One of the things that i wanted to do with my set was get each of the Redskins cards from 1959 and earlier graded, so i searched around and picked up what i could from eBay and from the local card shop just around the corner from me, Hoopla Sports. The guys there are great and have nice deals on what i’m looking for…this isn’t one of them though. 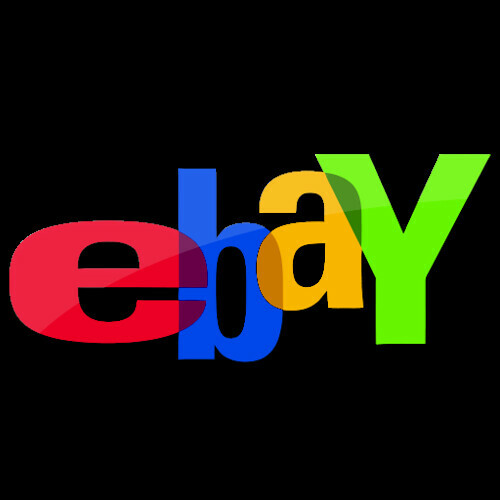 This one was scooped from eBay. Love how i drop the curve on you huh? completely unrelated story and then this image. 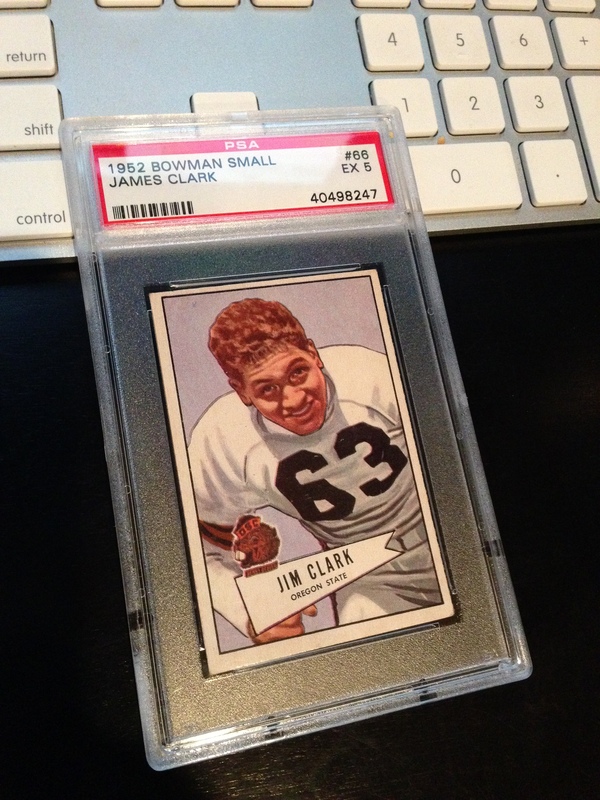 I love the smaller format cards from the 50’s. The card designers and artists did an amazing job with them and holding these pieced in your had you can really appreciate the amount of work that had to go in to each layout. OK, here’s my shot at ending on a high note. 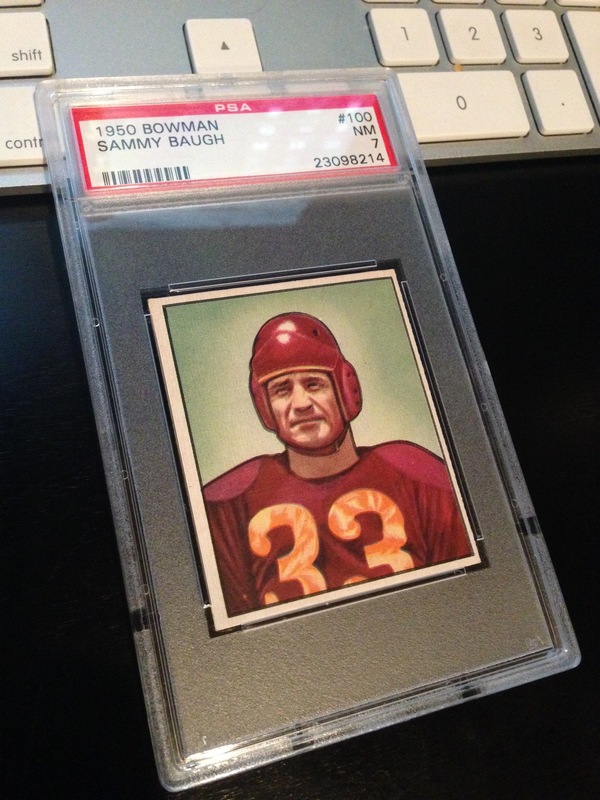 Another Slinging’ Sammy Baugh card…1952 Bowman Small. I waited and waited on this card in hopes of finding one at a great price from eBay and finally stumbled across a guy that had it listed as BIN. I made him an offer that he quickly refused and came back with something a little better. After another number from him, i finally got it shipped. 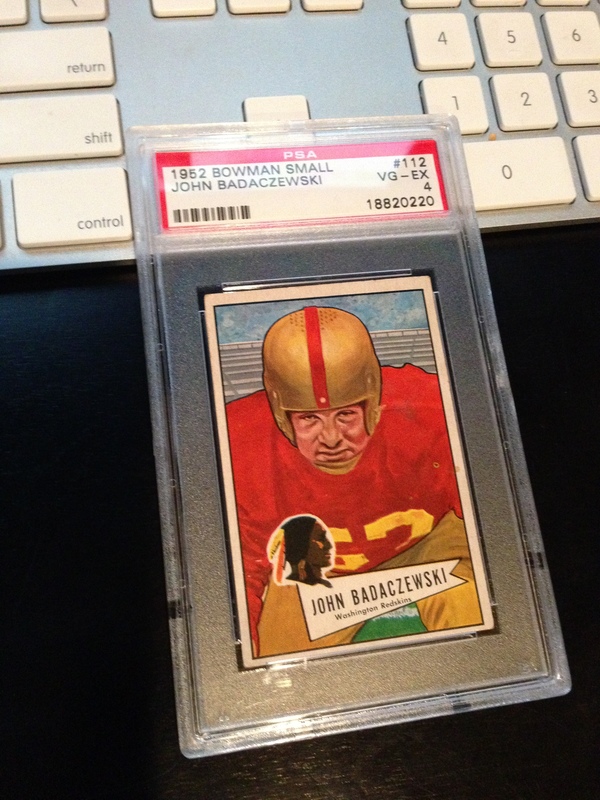 A little more than i hoped to get for it, but much less than others had their versions priced at. We have two shows coming up this month and i’m hoping to make one of them. The Cedar Hills show is much closer to me but tends to be less occupied by dealers and i end up walking away feeling like i wasted my time…but it is closer…if not, i will hit up the show at Mall 205 to see what they have going on…hopefully my friend from COMC, Tom will be there? 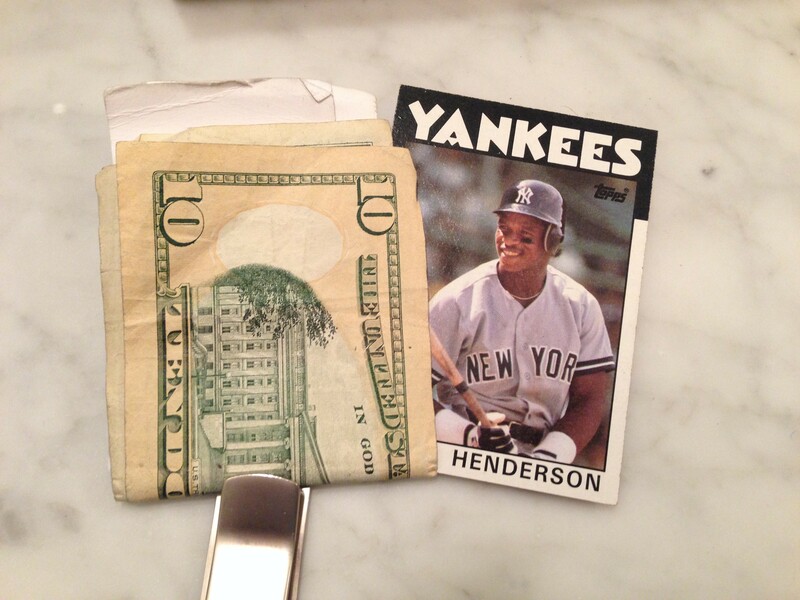 One last item, i am going to attempt to do the wallet card “challenge” and see what 365 days in my side pocket will do to a 1986 Topps Rickey Henderson. I chose this card because it has my favorite player on it in my favorite baseball teams jersey…and it was the first set i ever completed. Here is day one, which started yesterday…so 363 days in my side pocket. …side note, i’m rockin’ a money clip this year as i do not like wallets, so let’s call it the money clip challenge here.